The Orioles lost to the Indians yesterday afternoon by a score of to 6-1. The loss yesterday means that the team has lost 6 out of its last 7 games, after winning 8 of 9 games previously. Starter Jaret Wright, who came off the DL tried in earnest to deliver on Sunday, but he did not have any command, much less velocity on any of his pitches. He only pitched 3 innings, and allowed 3 runs and 4 hits. The offense once again struggled to get anything going and the only run the Orioles scored came off a solo homer by Aubrey Huff in the 9th inning. The Indians’ starter, Fausto Carmona pitched a masterful 8 1/3 innings and one gave up one run (the Huff homer), and only allowed 6 hits. He got a lot of groundball outs, and he also got some help from Grady Sizemore who made a couple of great defensive gems in the outfield. 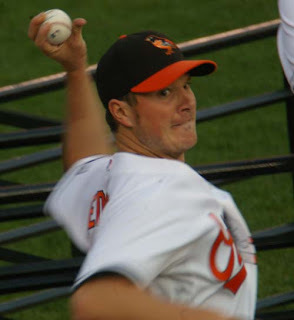 One of the few positives of the day for the O’s was reliever Brian Burress, who pitched four-innings of no-hit ball, while striking out six and walking three. Jaret Wright experienced the same pain he’d felt when he was on the DL this year, and it is unknown whether he’ll return to it, or perhaps be out of the rotation indefinitely. Baltimore Sun writer, Jeff Zrebeic has a recap of yesterday’s action in Cleveland, as does the Washington Post’s Adam Kilgore and the Baltimore Examiner. Meanwhile, the Indians placed a formal protest with MLB on Sunday concerning Saturday’s game. Erik Bedard is struggling, and has an ERA of over 6, but he’s not worried about it, as well Spencer Fordin notes that Erik Bedard may still be trying to find his groove. Beltway Baseball: The New Weekly Podcast About the Orioles and Nationals!! 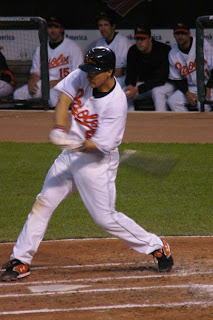 Beltway Baseball is a new weekly show on MVN.com that looks at the Major League Baseball in the Baltimore-Washington area focusing on the Orioles and the Nationals. I, and James from the Baltimore Flock will break down the past week, comment and analyze the two teams. Look for a weekly podcast on Sundays, and in the upcoming weeks we’ll have a live radio show where you can call us, IM us or email your comments or questions. Expect plenty of talk on the O’s and Nats! This week, in our inaugural show, we did a comprehensive recap of the season for both the Orioles and Nationals so far. - Sagging Attendance & Perception of the team in B'more fans eyes.. The Orioles beat the Cleveland Indians, but not without controversy by a score of 7-4. However, more importantly, the team snapped their 5 game losing streak. Some key players had big games including, Miguel Tejada and Brian both had three hits; however, Ramon Hernandez had an incredible day as he drove in 4 runs & had 2 hits, Corey Patterson drove in 2, and Miguel Tejada drove in a run as well. Erik Bedard threw six innings and gave up four runs, but struck out eleven (! ), but didn’t get the decision. Jamie Walker got the win, and the bullpen once again held check with the contributions of Chad Bradford, Danys Baez. Chris Ray got his seventh save. The controversial moment of the game came in sixth inning; actually, it happened in the third. Well, the O’s were up 2-1 on the Indians and Ramon Hernandez seared a line drive into centerfield that Grady Sizemore dove for and caught. Nick ‘the Stick’ Markakis was on third and looked to score off Ramon’s rocket. Miguel Tejada was on first, and Sizemore doubled him off, but Markakis has crossed the plate before he was tagged out. Well, the umpires realized their screw-up, and run got added the game in the sixth inning (the run got credited in the third inning) after they conferenced, and both Sam Perlozzo along with Tom Treblehorn, the bench coach made their case. Eric Wedge, the Cleveland would protest the game, as the change happened much later than the actual incident. Today, Jaret Wright comes back from injury and takes the mound against Fausto Carmona. Jeff Zrebiec has a detailed recap of the game on Saturday, as does Adam Kilgore of the Washington Post. The bullpen, which has been a source of strength, has been used a lot – I mean a lot. The starting pitching must get deeper into games, or else the bullpen will be tired by May or June. Adam Kilgore of the Washington Post has a piece on the bullpen, and as well as Jay Gibbons. Jay Gibbons is struggling and is 0 for his last 21. Well, Gibbons is not worrying about it and hopes to hit his way out of the slump. The Baltimore Sun has a question for Sam Perlozzo and it dealt how he handled the losing streak. Well, the Cleveland Indians are on the upswing, as they have won their sixth straight; meanwhile, the Baltimore Orioles have lost their fifth straight. Walks by Oriole pitchers, a huge 6th inning by the Indians, an infective bullpen and a 3-run inside-the-park by young superstar Grady Sizemore did in the boys in black & orange as they lost 5-4. Steve Trachsel had five scoreless innings until the 6th. He was effective, getting 2 outs before walking two and getting yanked quickly. Jeremy Guthrie was quickly inserted into the game, and based on his results Tuesday; it would be reasonable to figure he could get one out and keep the game in check. That was not the case. 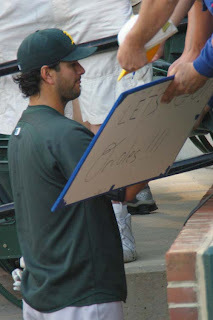 He hit one batter, David DeLucci, and then gave up a hit to Josh Barfield which allowed two runs. Then Grady Sizemore came up. He hit the ball over the head of Corey Patterson, normally an incredible outfielder, and it careened off the wall. Patterson fell out in the field, and by the time Jay Payton recovered the ball and threw it into the infield, Sizemore was well onto scoring & made the score 5-1. Brian Roberts added on two RBI’s late the game during the 7th inning, as did Ramon Hernandez, but it was not enough to win. Indians starter Jake Westbrook won his first game, while closer Joe Borowski got the save. Orioles’ starter Steve Trachsel got tagged with the loss. 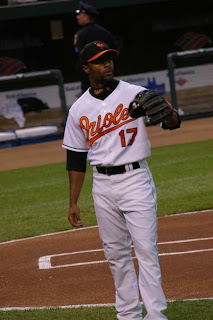 However, there was some good news for the Orioles – Miguel Tejada played in his 1,103rd consecutive game, sixth longest in history. The Baltimore Sun’s Jeff Zrebiec has a recap of the Baltimore Sun has a recap of the game, as does the Washington Post’s Adam Kilgore and the Baltimore Examiner. Jeff Zrebiec has more on Miguel Tejada and he moving into 6th place on the consecutive games played list. Selling the Drama - Schilling and More on the Sock: Well, Curt Schilling is now out to prove that his sick was indeed bloody with crimson red. He offered $1 million to anyone who could prove it was not blood that blotted his famous sock in the 2004 playoffs, and criticized members of the media in his blog, 38 Pitches, on Friday. "When I walked into the room for the post game interviews and offered up my first response to the questions about the game I basically said that the night was a revelation for me. That my faith in God that evening showed me things I’d never believed. As I uttered those words I could see pretty much every person in that room roll their eyes and smirk. That’s not what any of them wanted to hear, truth or not. That was not good copy. They needed more and what I didn’t give them, they got themselves." Take Gary Thorne, John, Jack Joe or whatever his first name is, Heyman, Karen Vescey, Woody Paige, CHB, Jay Marriotti, Bill Plaschke, and a host of other people that litter the media landscape, and put them all on an island somewhere. Does anyone stop reading their newspapers? Watching the shows they appear on? The answer to that is no. Instead of using the forums they participate in to do something truly different, change lives, inspire people, you have an entire subset of media whose sole purpose in life is to actually be the news, instead of report it. They have little to no talent at what they do and other than a mastery of the English language their skill sets are non-existent. It was blood. You can choose to believe whatever you need to, but facts are facts. The 25 guys that were in that locker room, the coaches, they all know it. In the end nothing else really matters. The people that need to believe otherwise are people with their own insecurities and issues. I'm siding with Curt on this one, but there has to be a time where you have to forgive and forget rather than extend a story, you know? I feel bad for Gary Throne and I’m sure it was an embarrassment to have attention brought onto him for a comment he made during a slow point of the game; however, Throne was a little silly in saying what he did. 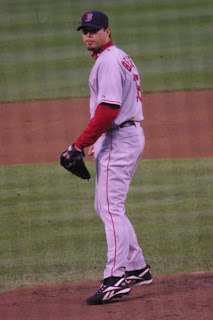 Throne, as a long time commentator should have known better, especially the importance of the ’sock’ to Red Sox Nation. John Smoltz and his Contract Extension: It looks like John Smoltz will be a Brave for even longer. According to the AP, he agreed to a contract extension yesterday that could be worth $39 million. In the report, it says that the new contract also includes a $12 million option for 2009 that becomes guaranteed if Smoltz pitches 200 innings the previous season. The club has an option for 2010, at a cost of $13 million if he pitches 200 innings in '09 or $12 million if he falls short of that total. Sammy Slams Two: Sammy Sosa's two homers set a major league record as he homered in his 44th ballpark at Cleveland's Jacobs Field. He had been tied with Ken Griffey Jr., and Fred McGriff with homers in 43 ballparks. He’s now got 594 career homers, 6 short of 600. Gregg Zaun on the Shelf: Blue Jays’ catcher Gregg Zaun had surgery on his broken right thumb and is expected to miss six to eight weeks. Torii Hunter Hit in the Mouth: Twins centerfielder Torii Hunter needed three stitches to close a cut on the inside of his mouth after he was hit by a pitch from Kansas City's Zack Greinke, and is okay. He should play today. Sorry about the lateness of the roundup post from last night. I’m not going to into the game summary, well, because we know what happened last night. The Orioles lost 5-2 to the Red Sox last night. We were up 2-1 in the 8th, and Willy Mo Pena came up. Willy Mo, who could not even hit his own weight as of last night, had two hits including a monster grand slam homer than went 430 feet to put the nail in the coffin for the Orioles last night in the 8th inning. 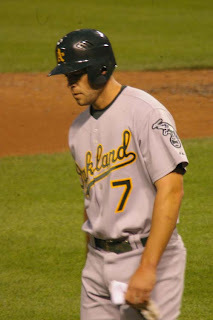 Of course, Chris Ray served up the Grand Slam (his second given up of the year) and took the loss. Adam Loewen did fine, as he pitched nearly 6 innings and gave up a run but he once again was inconsistent and walked five guys – just something you cannot do period, especially against the Red Sox. At this point, the offense is flat and needs to wake up. The good news is Ramon Hernandez is back, and he had 2 hits last night; however, Alberto Castillo was designated for assignment. Next, we have the Indians in Cleveland, and they are no push-overs, as they are on top of the AL Central. Right now, the Orioles offense needs to get in gear and the bullpen needs to right the ship, as the Indians have very few easy outs in their lineup. We had a rough week, so let’s look ahead. Roch Kubatko of the Baltimore Sun has a recap of last night’s game, and as well has his thoughts of the team on his blog, Roch Around the Clock. 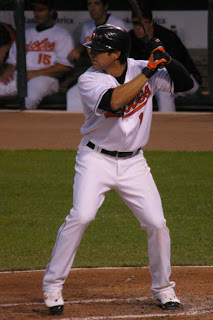 Jeff Zrebiec has more on Ramon’s return to the Baltimore Orioles lineup as does Adam Kilgore of the Washington Post. 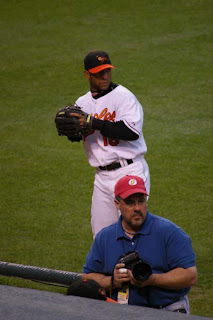 Heathir Irvin of Oriole Magic has a preview of the series with the Cleveland Indians. I was in meeting yesterday from mid-morning to late afternoon on Thursday and I posted on Throne’s comments early that morning – well, it was crazy how much the story blew up . I feel bad for Gary Throne and I’m sure it was an embarrassment to have attention brought onto him for a comment you made during a slow point of the game; however, he was a little silly in saying what he did. 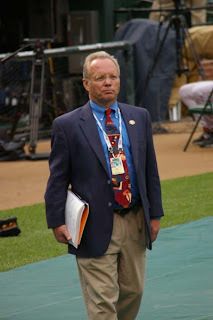 Throne, a long-time commentator should have known the significance of the 'bloody sock' to Sox fans. 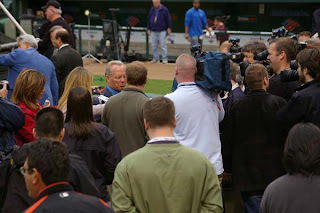 Yesterday, Gary Throne was accosted by the media, local and national, and it was a circus right before the Red Sox batting practice as there was an impromptu press conference held on the field. 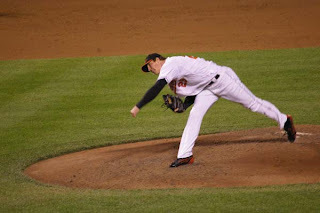 Rick Maese of the Baltimore Sun has more on Gary Throne, so does Spencer Fordin of the Orioles and the Washington Post. Sigh – I really like Curt Schilling’s openness, but he’s now gone a little too far with this story. You have to check out his blog, 38 Pitches for his latest stunt. We could forgive and forget, but this story is just, wow – wild. Willy Mo hits a Grand Slam off Chris Ray. Why was Chris Ray in the game? Sigh. Maybe we can stage another comeback. This will probably be my last post for tonight, but what a great ball game! I am at the game now and the Orioles are up 1-0 in the bottom of the third inning. So far, so good. Ramon Hernandez is back, and he could not have come soon enough. 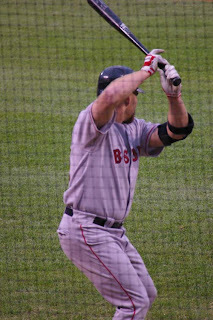 Loewen got into some tight spots after striking out the first three hitters, including David Ortiz in the first. 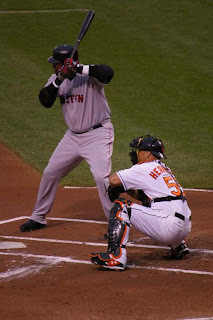 Disaster got averted in the third inning, as the bases were loaded and David 'Big Papi" Ortiz was up. Ortiz hit the ball back to Loewen for the third out of the previous inning. Melvin Mora just drove in a run to make the game 2-0. I am here at the Yard and I'll try to blog from the game tonight. Well, if you all have not been to a Red Sox/O's game at the Yard, there are not many of us. There's a sea of red and blue here, and that's the way it always is. Anyhow, Gary Throne and Terry Francona met during batting practice, and it was a media circus. 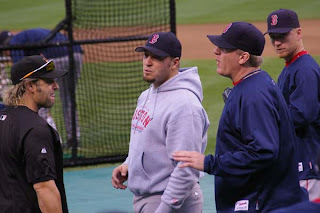 As well, Curt Schilling, Kevin Millar, Doug Mirabelli and Francona met and conferenced as well. Game time in about 1/2 a hour so. Well, most baseball fans know of the 'bloody sock' game that Curt Schilling pitched in the '04 ALCS (game 6) to tie the series for the Boston Red Sox. Now, someone is questioning the validity of that game. 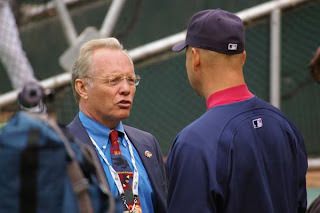 However, it's none other than MASN's own Gary Thorne. Well, I can only imagine the coverage this is getting in Boston. Well, here are some quotes from the higher-ups on the Red Sox, and from Curt ’38 Pitches’ Schilling himself. Now, I am no fan of the Red Sox – but one of my best friends in Marblehead, Mass., is and I can only imagine what is going through his mind at this moment. I’ll say watching the 2004 ALCS myself – there is no way the bloody sock story is fake. I believe Schilling did indeed pitch with a bloody sock, and what transpired with that game and the 2004 World Series was special. Schilling, for that game, no matter what I have said about, you have my respect for life. It takes a real ballplayer and a man of grit to pitch through all of that. However, I need to take Gary Throne (a MASN guy – a basically an employee of the Orioles to task) and Jim Palmer too for not even refuting the assertion Throne made. It’s been proven time and time again that Schilling did indeed pitch with sutures in him, and they did break, thus blood leaked out. Do we need a freaking DNA test for this now? What’s especially shocking to me was that Gary Throne, not only a veteran of baseball play-by-play, but hockey, would even say such a thing – especially something that is pretty much fact. I don’t know if he was trying to make conversation with Jim Palmer, or perhaps was just bored but needed to talk about something, but his thoughts were just way off base. 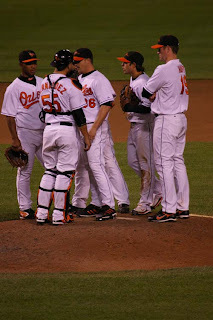 Well, last night the Orioles lost to the Boston Red Sox 6-1 at the Yard. For the first seven innings, a real competitive game took place as Daniel Cabrera was on the hill for the Orioles and Curt ‘38 Pitches’ Schilling. Cabrera pitched well, as he struck out 5, but also walked 5 and went 6 2/3 innings. His only run was given up to Alex Cora, of all hitters. However, Schilling pitched 7 innings, walked two and struck out 3. The turning point in the game came when Daniel Cabrera was yanked after walking a batter to load the bases in the top of the seventh inning. 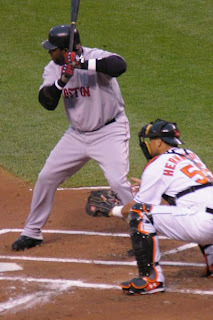 Jamie Walker, the main left-handed specialist in the bullpen faced the ever-tough David Ortiz in a classic pitcher vs-batter battle, and Ortiz kept fouling pitch after pitch off. The count got to three balls and two strikes, so with the shift on for Ortiz, he went the other way and dumped the ball into left field, driving in a run and making the score 2-1. Walker was yanked from the game thereafter. 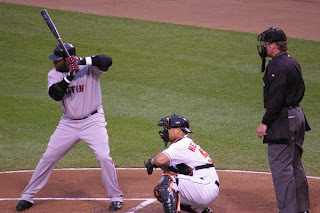 Afterwards, Manny Ramirez drove in another run off Chad Bradford who came in relief of Walker, and the score became 3-1. Bradford, who has been nothing but effective this year, walked two straight batters, including walking in a run and made it 4-1 in favor of the Red Sox. Thereafter, call-up James Johnson pitched the ninth inning and gave up 2 runs, thus racking up the score to 6-1. For perhaps the first time season, the bullpen did not keep the Orioles in the game. The O’s offense was dead last night, with the exception of Miguel Tejada’s second homer. 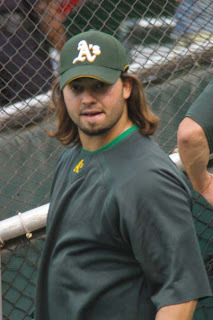 Hopefully we can come back and hit pay-dirt against Josh Beckett, no easy customer. 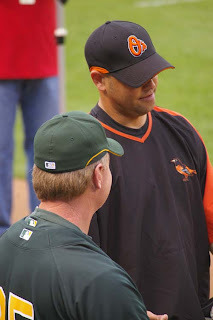 Before I go into the news, a special thanks needs to be given to Tony Pente of Orioles Hangout for setting up a game where fans and forum members of the site could meet, congregate and root for the Orioles. I almost never sit in the upper deck, but it was cool to meet up with other fervent O’s fans, especially in a place that was surrounded by Red Sox fans! The site is offering “Take Back the Yard” nights with games specifically earmarked for the Yankees and Red Sox, plus one game with the Cleveland Indians (details are on the site). So, I missed the first 6 innings due to work & the radio show; however, it was very cool to hang with some real Orioles fans that evoke a passion not seen in the Yard these days! I met some wonderful people, had great conversation and put names with faces. If you don’t check out Orioles Hangout – do so, it’s the premier site for Orioles fans. Baltimore Sun writer Roch Kubatko has a recap of the game and as well thoughts on his blog, Roch Around the Clock. As well, Spencer Fordin has a recap of last night’s game. On that note, The Baltimore Examiner reports that Jaret Wright may be ready to go on Sunday. 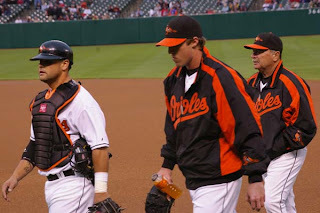 Baltimore Sun writer Rick Maese thinks the Orioles’ nucleus of Roberts, Mora and Tejada are looking unstable. Personally, all three have not looked too great and have made quite a few lapses this week; however, I guess this stuff happens in the course of a 162 game season. At this point, the trio needs to get things in order quick as much of the team’s success goes through them. Well, the Boston Red Sox are in town, and that will probably mean that the Inner Harbor may be painted red and blue for a few days with fans, and there will be incessant chants of, “Let’s Go Red Sox” abound at the Yard. However, the game in between the lines is what counts. Hopefully, we can reverse the trend of the Red Sox winning so often against us. Well, in this series, we’ll probably be facing two of the Red Sox’s best pitchers, and we’ll need to be ready for them. The matchup that intrigues me the most is tonight’s matchup, Schilling and Cabrera. Schilling, the wily veteran looks as good as ever (though he was shelled by the Yanks), and Daniel Cabrera has been solid, though at times he’s had to deal with inconsistency. The Red Sox have a lineup that can mash with anyone, and Daniel will need to be on. On Wednesday, the Orioles counter with Josh Beckett, who is having a heck of a start to 2007. He’s got his makeup back that made him such a force in Florida, and he’ll be tough to deal with if he’s on. 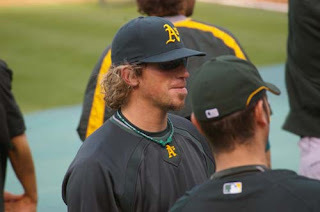 Adam Loewen takes the mound for us, and we know what he’s done against the Yankees – can he do the same with the Red Sox. He’ll need to be consistent and locate his pitches where he wants it to be, or there could be longballs hit all night. 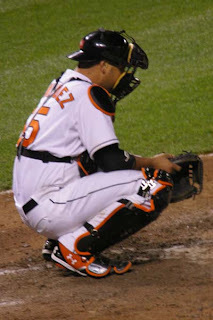 Jeff Zrebeic has a recap from last night’s game and as we all know, the Orioles made quite a few mistakes that cost them yesterday’s game. Zrebeic gets quite a few words from players such as Jay Payton and the starting pitcher, Jeremy Guthrie. The Orioles placed reliever Scott Williamson on the 15-day disabled list Tuesday because of tightness in his right triceps tendon, and have called up pitcher James Johnson from Triple-A Norfolk. As we are on the cusp of the Red Sox series this evening, much of the Yard and the Inner Harbor as well as the surrounding area will be awash in red and blue. Well, as much as hate them coming to town, they help out the economy. Even though Camden Yards has been sagging in terms of attendance, the Orioles are still making money – thanks to the passion of Red Sox and Yankee fans that follow the team. Rick Maese of the Baltimore Sun takes a look at the impact of Red Sox fans and how they impact the Baltimore economy, mainly around Camden Yards. It’s a piece worth reading. 'The Hits Keep Coming' - Episode Seven, Tonight!!! Bloggers Ian of Random Thoughts and Jason of My Baseball Bias and I produce an hour long baseball show every week called, “The Hits Keep Coming” on Blog Talk Radio. Every week at 7PM Eastern Time (6PM Central/ 5PM Mountain/ 4PM Western/Pacific) we chat, analyze and comment about the world of Major League Baseball. 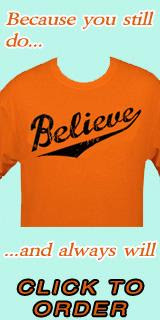 Join us at: http://blogtalkradio.com/oriolepost at 7PM Eastern Time tonight! * How ‘Bout that A-Rod, his start and does he opt out of his deal? I am just watching the replay of this game now (well, I know we lost, however a game like this one that really hurts). I didn’t go to the game, nor watch it at work, but I caught a little of what was said online at the various forums, and almost everyone universally slammed the play of the team, especially the infield. The O’s lost by a score of 4-2. This is a game that should not have been lost. The Orioles beat themselves today by miscues, bad play and mental mistakes. More or less, Guthrie should not have lost the game, and Melvin Mora’s error allowed a run to come in, and then another scored off a sacrifice fly. Jeremy Guthrie was impressive, and with Jaret Wright possibly back next week or so, he left an impression on those who witnessed his pitching performance. The O’s scored in the second as Jay Payton drove in Aubrey Huff (after he tripled), and once again in the seventh thanks to a RBI by Huff. 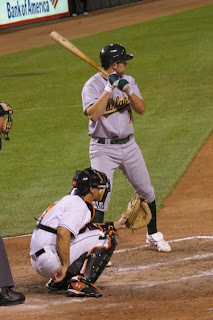 The A’s scored 2 more runs in the sixth inning (should not have happened), as John Parrish was pitching in a bases loaded situation and a ball was hit to second off the bat of Jason Kendall. The ball approached Brian Roberts and he flipped the ball towards second to get the force out. The only problem was that Miguel Tejada was not covering second base. A run came in off that play, and another scored thanks to a walk by John Parrish. There was no comeback today, and Huston Street got the save. 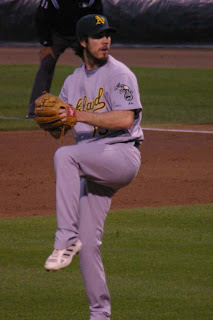 The starting pitcher for the A’s, minor league callup, Dallas Braden pitched six innings and struck out six. He won his first major league game. Well, a nice start for a young pitcher. On that note, Miguel Tejada played in his 1,100th straight game, the seventh longest in baseball history. Well, the Orioles just need to lick their wounds, forget about today and play good fundamental baseball from here on out. The Red Sox are coming to town, and they are always tough customers with Curt Schilling and Josh Beckett taking the hill against us. The town will be painted in red and blue for the next few days, as Boston fans make their pilgrimage into the Yard. If we can play like we did until Monday against the Red Sox, we can definitely split, or win the series, or at least make things interesting. With a lineup with David Ortiz, Manny Ramirez, and a cast of seven others, it’s a tall order. The Washington Post has a recap of the action from Tuesday afternoon, as does the Baltimore Sun. Roch Kubatko has his thoughts and tidbits from the game. According to Alexander Pyles of the Sun, both Jaret Wright and Ramon Hernandez felt okay in their rehab starts. Ramon felt tiny discomfort, while Jaret was pain free. Ramon may be back on Friday to join the team in Cleveland, and Jaret Wright might be back during the weekend. Dan Connolly of the Baltimore Sun has a great article on the Orioles and their international scouting situation, in which they have no involvement in Asia and as of right now, the Orioles lag far, far behind. Well, “the bunt”, by Melvin Mora is still news in Oriole-land today as all the various blogs, newspapers and forums had their say about it. 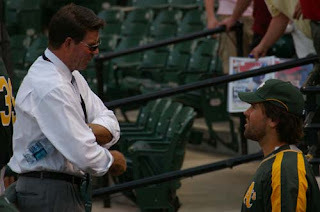 Spencer Fordin reports that Melvin Mora (when he addressed the media) he tried to catch the A’s off guard in the 9th inning, and it was pretty much his decision. 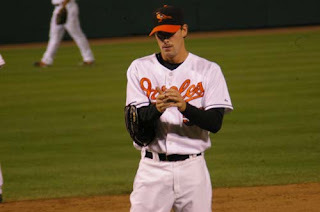 Baltimore Orioles right-hander Scott Williamson was placed on the 15-day disabled list on Tuesday because of tightness in his right triceps tendon, reports the Baltimore Examiner. Obviously, one man does not make a team; however, A-Rod is carrying the Yankees on his back. Without him, they could easily have 5 wins, or maybe even fewer. With his offensive barrage last night with his two homers, he has hit 14 long balls in April, tying a record. Considering the drama he had gone through as a Yankee, plus with some of the media whipping he’s received over the past several seasons, it only makes it even more remarkable what he has been able to achieve this month. All in all, he looks like a completely different player. A-Rod is now focused, has the killer instinct and not one who thinks too much on his feet as to what’s going on in the game, or even worse outside of it. You have got to be in awe of what Alex Rodriguez is going right now. 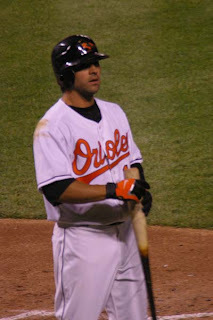 As an Orioles’ fan, I know the pain that he is now inflicting on other teams at the moment, as he hit a walk-off (grand-slam) home run off of us to win a game back in early April. The big question on everyone’s mind is will he stay in New York City and remain and Yankee, or will he go? If you asked me before the season, I would have said he stays in New York because he would not want to have been seen as a quitter. Looking at things as they are now, I think he’s a goner from the Yankees after the season. Right now, Alex Rodriguez is on pace to hit 100 plus home runs and 400 plus RBI’s. Will that happen – probably not. In my mind, he will arguably be one of the best, if not the best, all-around player in the history of the game. However, if he can continue his success throughout the whole year, what will that mean? From the outside looking in, nothing; however, that changes if the Yankees win the World Series. At the rate that the Yankee pitching is going, that might not happen, and all Alex’s success will be worthless. In light of it all, if Alex slumps, he’ll be booed like he has in the past. His April will be forgotten and will be a part of history. In the end, does he stay after ’07? He’s got a huge payday waiting for him if he opts out, and the way he looks and the numbers that he could possibly project; he will not be Yankee after the season unless they renegotiate his deal. If the Yankees don’t resign him, there are a litany of other teams waiting, like the Cubs (A-Rod has a great relationship with Sweet Lou), the Angels, and several others. The money is too good, and since he is a client of Scott Boras, it’s only fathomable that he’ll get the best deal possible for Alex. He may or may not leave the Yankees after the season, but he’ll have a new contract. If you happened to be at the game last night, or saw it on MASN, you know towards the end it was a thrill-a-minute game, and the Orioles staged a mounting comeback in which they nearly won the game. Sadly, we were just a hit away from tying, and most likely winning the game. The team had Huston Street, one of the best closers in the game on the ropes. However, Street was able to prevail and get out of a jam last night, thus killing the Orioles' momentum. 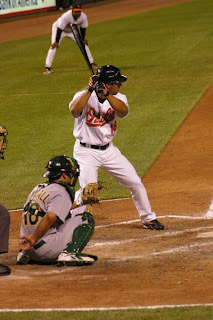 The Baltimore Orioles lost a very competitive game to the Oakland Athletics, by a score of 6-5. 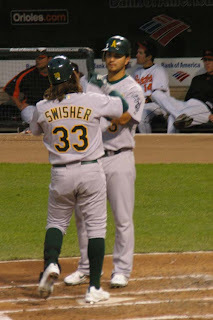 Sadly, the A’s led by Nick Swisher have halted the O’s winning streak. Well, much was made about the conclusion of the game on the radio and in the newspapers. Seeing the action live, I was almost dumbfounded as to why Mora was bunting; however, considering Corey Patterson was at third (as we all know he’s fast) and Melvin is proficient at the bunt – it sort of made sense. Things did not go right. Whether it is a missing a sign, or miscommunication, Melvin bunted back to the pitcher and got the second out of the 9th inning, thus Corey did not wind up scoring. Nick Markakis got walked intentionally, and Miguel Tejada grounded out the second baseman to end the game. Well, the Orioles’ ace Erik Bedard started the game and was ever so good for three innings. And, then came the fourth inning. Erik Bedard in the 4th inning just lost his command of his pitches, and let five runs come in that inning, including a two-run homer to Nick Swisher. Bedard also ran into trouble in the fifth inning, as the bases were loaded for another potential rally, until Scott Williamson came in and shut things down. 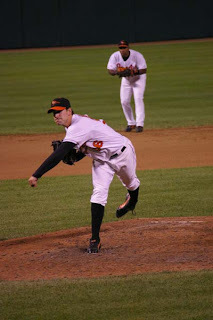 Brian Burress came in and pitched 2 strong, scoreless innings and that kept the Orioles in the contest, and allowed them to stage a comeback. 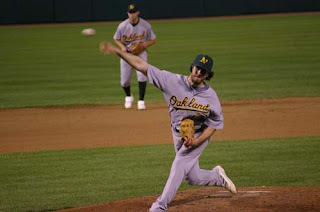 The starter for Oakland, Dan Haren pitched well, throwing seven innings and giving up one run, which was a solo homer to Brian Roberts. 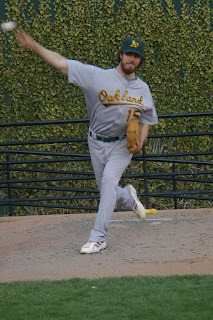 Haren, last night showed why he is one of the best young starting pitchers in the league as he has an ERA at 1.41. 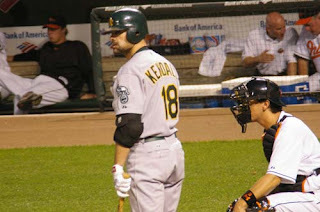 Aubrey Huff lead the comeback as he hit a three run homer off reliever Alan Embree in the 8th, and the Yard went wild. The Orioles were within one run as the score was 5-4 at the end of the 8th, but reliever Danys Baez came in and gave up a homer to Nick Swisher (again), as he hit has second of the night. Today, Jeremy Guthrie is slotted to start for the Birds this afternoon against the Athletics. Jeff Zrebiec of the Baltimore Sun has a very detailed recap of the game, and Roch Kutbako gives us an insider view of what happened in the locker room after the game with thoughts from players and manager, Sam Perlozzo. The Baltimore Examiner and Washington Post have a recap of the game as well. According to Roch Kubatko, Jaret Wright and Ramon Hernandez will both be in Frederick tonight, and will rehab for the Single-A affiliate of the Orioles, the Keys. In the same entry, Jeremy Guthrie will be starting tonight, and front office executives, Jim Duquette and Mike Flanagan were in Atlanta to watch some potential top draft picks. With the return of Jay Payton (he’s slotted to be the every day left fielder), Sam Perlozzo will have to juggle playing time between Kevin Millar and Jay Gibbons. The Washington Post’s Adam Kilgore has news on Scott Williamson (he left the game with tightness in his shoulder) and will undergo tests on Tuesday. As well, in the piece, there’s news on Aubrey Huff. Much has been made legendary Leo Mazzone, as he had unprecedented success with the Atlanta Braves. 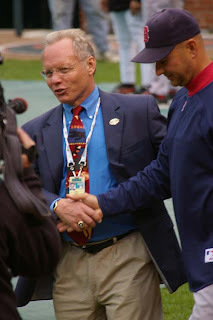 However, after a lackluster 2006 and rumored problems with some pitchers, a few people figured that Leo Mazzone’s success over the years was a fluke. Keep in mind that Leo did not have much of this staff to work with because of the World Baseball Classic 2006; however, he had a full staff to work with in spring training this year, and so far it’s been successful, especially with the bullpen and the young pitching starting to break through. 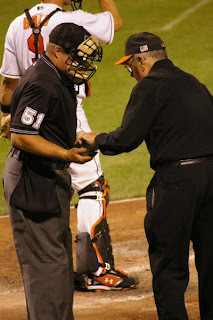 John Eisenburg has an article on Leo Mazzone and how the Orioles have looked so far in 2007 under his tenure. Torii Hunter Gets a Slap on the Hand? Torii Hunter is a nice guy and a great ambassador for the sport; however, he might have crossed the line this past weekend. According to ESPN: “Hunter's gift of four bottles of Dom Perignon, which he had delivered to the Royals clubhouse this past weekend, was meant as a reward for the Royals sweeping the Detroit Tigers last September, allowing the Twins to come from behind to win the American League Central. The gift fulfilled a promise Hunter made last fall. But baseball has rules about this sort of thing. Namely, rule 21-b, which proclaims "Any player or person connected with a Club who shall offer or give any gift or reward to a player or person connected with another Club for services rendered ... in defeating or attempting to defeat a competing Club ... shall be declared ineligible for not less than three years." Nice. Torii says he didn’t know the rules. Hey, I still think it’s cool he did that. 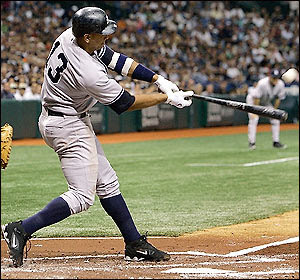 A-Rod: The Hitting Freak: Can we officially say that A-Rod is over his issues as a Yankee? The freak A-Rod hit his 13th and 14th homers of the year, but the third baseman's big hits weren't enough to pull the Yankees out of a slump. Of course, not matter what he does, if he does not win a championship, his April will just be trivia in the future and go into the annals of history. Philip Hughes: As we know, the Yankees pitching has been nothing of short of a train wreck. With Pavano, Mussina and Wang on the DL, the Bronx Bombers have need to call on reinforcements, and they plan on having their top pitching prospect start Thursday against Toronto. The Yankees had been saying all spring that Hughes would progress slowly through the system, but that is not the case with the team’s struggles. Iwamura on the DL, Cantu Back Up in the Majors: The Tampa Bay Devil Rays on Tuesday placed third baseman Akinori Iwamura on the 15-day disabled list with a right oblique strain, and have recalled Jorge Cantu. Eric Gagne on the DL: The Texas Rangers put closer Eric Gagne on the 15-day disabled list Monday, with a hip injury. Harden & Bradley on the DL: The A’s placed Rich Harden, their ace, on the 15-day disabled list Monday with a strained right shoulder along with Milton Bradley. Felix Hernandez on the DL: The Mariners placed their young flame-throwing righty on the 15 day DL as he was diagnosed with a muscle strain inside his right elbow and forearm. Huff hit a three-run homer in the 8th and the place went crazy. Brian Buress held the game in check for us, pitching 2 great innings of relief, and now we are on the threshold to an amazing comeback if all goes right. For a small crowd, from where I am sitting it sounds like a college football game with the small contingent of Oakland fans going back and forth with the O's fans. Well, we are now in the ninth, and Danys Baez is in the game. We are in the top of the fifth inning, and right now we are down 5-0. 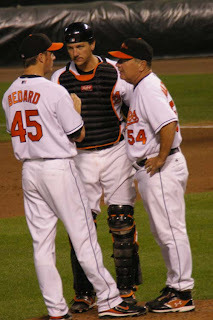 Bedard really seems to be struggling tonight with his command, but he is still in there battling. He's struck 5 or so far, and has been really shaky. Nick Swisher hit a 2 run homer and that opened the flood gates in the top of 4th inning. Perhaps if Bedard and the 'pen can hold the A's at 5 runs, we might be able stage a comeback. You have to give props to the A's, as they have one of the most patient lineups in the sport today. Ok, Bedard is being yanked -- the bases are loaded. He's got some of the best stuff in the game, but tonight he was not on. On that note, Oakland seems to have really good representation out here in terms of their fans. I am at Oriole Park, and it is a splendid evening out. Well, I am back on the mothership this evening and it's 0-0 so far. Here are some pictures from batting practice and before the game. 'The Hits Keep Coming' - Episode Five, Tonight!! !